Although I'm primarily a Marvel person, I'm starting to branch out and read comics from different publishers and independent artists. 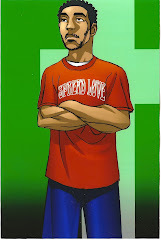 For a while, I told myself (why I was so stubborn, I'm not quite sure) that I was a Marvel person, not a DC person. However, the pointlessness of that stance has been made obvious to me, as I've realized that I'm not a Marvel person, but a good story person. If there's a comic book story out there that does a great job of portraying the highs and lows of humanity, and our need to strive towards that which is good, then I want to read it. 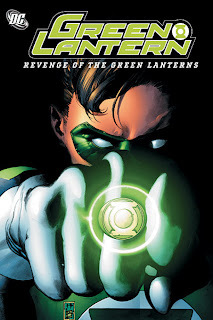 Recently, I started reading comic books on the Green Lantern. He's someone I've been interested in learning more about for a while, but in preparation for the "Blackest Night" story arc (more on that coming soon), I figured now is the best time to familiarize myself with the Green Lantern. 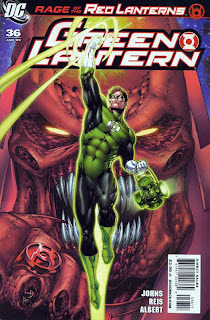 I recenty just got finished reading the "Revenge of the Green Lanterns" and the "Rage of the Red Lanterns." I have to say that the Rage of the Red Lanterns is arguably the best comic book story arc I've read all summer. Disclaimer to Green Lantern fans: I'm new to the Lantern Corps mythology so if I get something wrong, my apologies. The purpose of this post is not to summarize the stories in these comic books, or to add my two cents on why I think the Green Lantern's (Hal Jordan)'s shacking up with various women is problematic, lol. I want to talk about the breadth of the Lantern corps. Up until recently, I thought the Green Lantern corps was the only corps responsible for the welfare of the universe. As the "universe police," various members of the corps are assigned to different sectors of the universe, making sure people are not breaking the law, and that the lives of living creatures on various planets is valued and protected. Their strength (which is represented in their ring), is will-power, allowing them to create things weapons and perform certain feats at will. They are the good guys, upholding justice throughout the universe. What's interesting is that each corps believes that their particular emotional power plays the most important role in human behavior. For instance, The Yellow Corps generally believe that it's fear that makes the world go round, whereas the Blue Lantern Corps believe that the key to humanity is hope. The Blue Corps also claim that hope is the most powerful of the emotional powers, which makes for another interesting topic of discussion. The Blue also drains the power of the Yellow rings, but accelerates the power of the Green rings. Interesting isn't it? What also strikes me about these different corps is that membership is an absolute thing, such that depending on the choices one makes and the extent to which one is able/unable to manage and coordinate his or her emotions, one can "lose" a ring and "acquire" another ring of a different color. For example, Sinestro, the leader of the Yellow Corps, used to be one of the best Green Lanterns to serve the corps, and is responsible for training Hal Jordan, who currently holds that title for the Green Lantern Corps. Another example comes the "Rage of the Red Lanterns" story. A member of the Green Lantern corps, due to violating the principles of her corps, had her ring taken from her. However, the path she had started on (which led to her actions that resulted in her losing her Green ring) "led" her to a Red ring, before being presented with the opportunity to "re-acquire" a Green ring. LOL, it's a long story, and you should read it to get the unabridged version. I'll probably continue posting on this topic in the near future, as I will not be able to cover everything I wanted to cover in one post. I just wanted to get some initial thoughts I had about the Lantern Corps out there, as I think the mythology behind the Lantern Corps and the colors reveal some interesting "truths" about the human condition, and how emotions are related and coordinated. I don't agree with everything, but there are some general ideas from the Lantern Corps that I think are useful in helping us better understand one another. What do you think? Do you read and Green Lantern? If so, why? Which emotion do you think you (a) utilize the most? (b) have the best handle on? (c) struggle with the most?